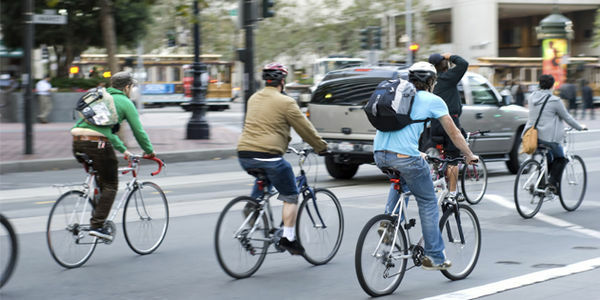 Tell San Francisco Not to Crack Down on Bicyclists! The San Francisco Police Department is planning to crack down on bicyclists who treat stop signs as yields. This is bad news for bikers. I'm a bicyclist living in San Francisco, and yielding at stop signs is simply safer and more efficient for bicyclists. Idaho is currently the only state that allows this -- called an "Idaho Stop" -- and a study showed that it is indeed safer. Please sign this petition to tell Captain John Sanford to focus the SFPD's resources on citing people for the worst traffic violations, not targeting bicyclers. The SFPD is cracking down on bicyclists despite the fact it has committed to Vision Zero, which is an effort to end to traffic deaths. Vision Zero means focusing on issuing citations for the top 5 causes of traffic injuries, which are all driver violations. Yet for some reason, the amount of tickets being issued to pedestrians and bicyclists in SF is actually growing 7x faster than citations for drivers committing “the five!" Criminalizing bicyclists discourages the activity, even though it is a net positive in terms of decreasing city congestion, helping the environment, and improving personal health. It simply doesn't make sense to apply laws written for cars to bicyclists, as bicycles can easily yield the right-of-way without coming to a complete stop. The crackdown will effect bikers in The Wiggle, North of the Panhandle, and Golden Gate Park. Yet there are exactly zero reports of bicyclist-caused collisions in the Wiggle. SF is considering a proposal to ensure the police treats bicyclists yielding at stop signs as lowest enforcement priority, but Mayor Ed Lee has threatened to veto it! To speak up, you can 1. Email Ed Lee (mayoredwinlee@sfgov.org) 2. Share this petition 3. Or make public comments at City Hall, Legislative Chamber, Room 250 on Dec. 7 at 1:30 pm! Your signatures made a difference! On Aug. 11, signatures were delivered to Capt. John Sanford in person. Learn more about the event here. Thanks so much to all who signed, and keep sharing to keep the pressure up!